CAPE CANAVERAL, Florida - Watch live online the countdown and launch of NASA's Origins, Spectral Interpretation, Resource Identification, Security-Regolith Explorer (OSIRIS-REx) spacecraft from Florida to an asteroid that will bring a sample of the space rock back to Earth. The 4,650-pound (2,110-kilogram) fully-fueled spacecraft is scheduled to launch aboard an Atlas V 411 configuration rocket at 7:05 p.m. Eastern Daylight Time on Thursday, September 8, 2016, from Space Launch Complex 41 at Cape Canaveral Air Force Station in Florida. There is a two-hour window for each launch opportunity. 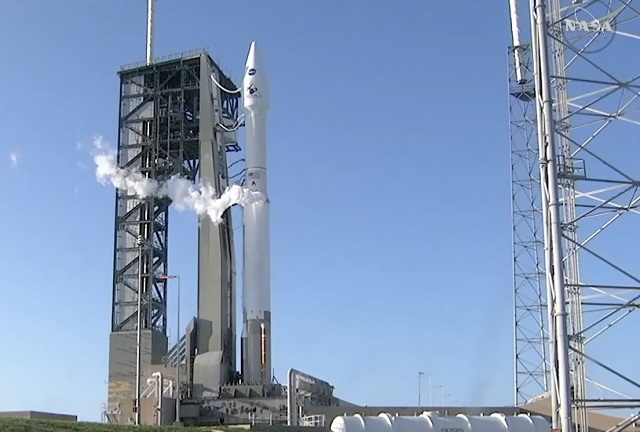 According to the latest weather forecast from the United States Air Force 45th Weather Squadron, there is an 90% percent chance overall of acceptable weather conditions for Thursday's launch. After a careful survey of the near-Earth asteroid Bennu to characterize the asteroid and locate the most promising sample sites, OSIRIS-REx will collect between 2 and 70 ounces (about 60 to 2,000 grams) of surface material with its robotic arm and return the sample to Earth via a detachable capsule in 2023. Bennu is believed to be one of the oldest asteroids in our solar system. Scientists expect Bennu may hold clues to the origin of the solar system and the source of the water and organic molecules that may have made their way to Earth. Bennu may also harbor organic material from the young solar system. Organic matter is made of molecules containing primarily carbon and hydrogen atoms and is fundamental to terrestrial life. The analysis of any organic material found on Bennu will give scientists an inventory of the materials present at the beginning of the solar system that may have had a role in the origin of life.